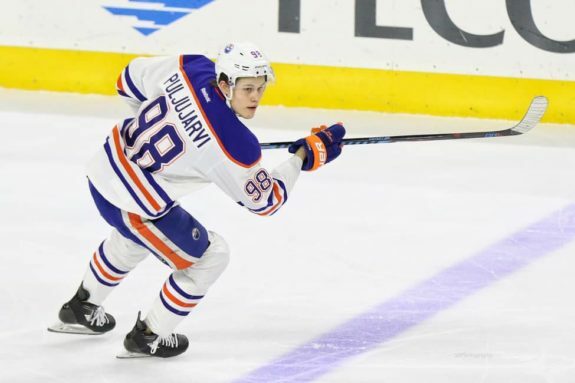 ANAHEIM, Calif. — Connor McDavid and Leon Draisaitl scored again, Cam Talbot made 39 saves for his first shutout this season and the Edmonton Oilers earned their second victory in nine games by beating the skidding Anaheim Ducks 4-0 on Sunday night. It was a strong bounce-back win for the Oilers, who lost 4-0 to Los Angeles on Saturday night. They scored three goals in the first period for the second time this season and controlled action on both ends of the ice despite being outshot 39-24. McDavid, who began the day fifth in the NHL in scoring, has five goals in his last seven games. Draisaitl has seven in the past seven games. Jesse Puljujarvi and Kyle Brodziak also scored. Ryan Nugent-Hopkins and Caleb Jones each had two assists. Anaheim has lost eight straight after winning four in a row and nine of 10. John Gibson made 20 saves for the Ducks, who are 0-2-2 during a six-game homestand — their longest of the season. The Oilers opened the scoring at 7:37 of the first period when McDavid finally was able to get the puck under Gibson’s blocker on his third attempt from in front for his 24th goal of the season. A no-look backhand from the slot by Puljujarvi at 16:05 and a short-handed goal by Brodziak with 11 seconds remaining marked the first time since Jan. 21, 2017, at Calgary, that the Oilers have led by three or more on the road at the end of 20 minutes. It was the third time this season Anaheim had allowed three goals in the first period but it was the first time it trailed by three or more in the period since Feb. 3 last season at Montreal. Draisaitl scored at 7:25 of the second when he corralled a shot by Jones that was blocked by Anaheim’s Ondrej Kase and fired a wrist shot past Gibson to make it 4-0. NOTES: Anaheim D Cam Fowler played in his first game since missing 23 after taking a puck to the face Nov. 12 against Nashville. The puck ended up breaking Fowler’s right orbital bone, right cheekbone and right jaw bone, requiring surgery. … Brodziak has four short-handed goals since the start of last season. … Anaheim executive vice-president/general manager Bob Murray became the fifth person in NHL history to both play and serve 1,000 games as a GM. He joined Bobby Clarke, Bob Gainey, Bob Pulford and Doug Wilson. Oilers: Play at San Jose on Tuesday. Ducks: Host Ottawa on Wednesday.